In my last blog entry I talked about ‘visual reserves’ and how important this concept is for long term comfort and for VT to be successful. The improvement of eye lens focusing and eye movement amplitudes individually is not enough for it to stick. You need to be able to execute those visual skills simultaneously, effortlessly and automatically. Another great illustration of this processes by Dr Maino is shown below. Mastering those skills paves the way for further consolidation and visual/sensory development of the brain. 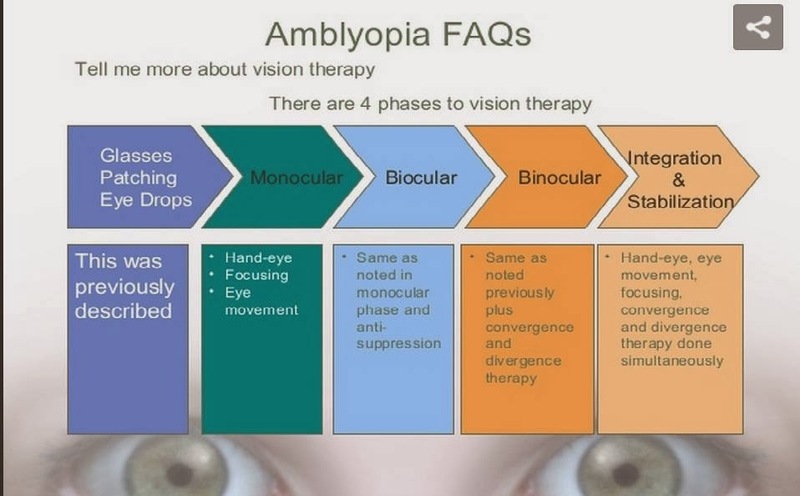 Check out the entire slide show for more informative illustrations like these:http://www.slideshare.net/DMAINO/what-is-lazy-eye. At this point in time, I feel like I’m oscillating between the orange binocular box and the integration stabilization box. However it’s not that clear cut. As you do a lot of integration, stabilization and loading, those skills also keep getting better individually while improved timing and daily application make for even more added value. When it comes to eye lens focusing (accommodation) and eye movement (vergence), I have clear single vision under relaxed, undemanding circumstances. But that’s not enough to live a proper life, so you want to go beyond that. To accomplish that you need to artificially separate the accommodation and vergence distance. Nice examples of these are cross-eyed 3D photos and parallel viewing stereograms. In case of cross eyed 3D photos, the vergence distance (the intersection of the visual axes) falls in front of your computer screen whereas the accommodation distance is the actual distance of where your screen sits on the desk. You have artificially dissociated both processes. On the other hand, in case of parallel viewing stereograms the vergence distance is way farther than the accommodation distance. You have to be able to do some serious visual flexing to accomplish both these artificial situations. This kind of visual gymnastics will grant you some nice ‘visual reserves’ over time. A classic VT exercise based on the same principle is the aperture rule. Even though you can in principle do the same thing with a computer screen, I very much like the simplicity of this gadget. It’s easy to use and makes you jump through the right hoops in order to achieve the same goal. By adjusting the aperture slide you gradually adjust difficulty and have a frame of reference to keep track of your improvements. In VT the expression ‘degrees of freedom’ is used in describing the process of building a stronger and more flexible visual system. I very much like that expression. It’s accurate in describing the process and correctly implies that visually impaired people are less free in acting, interacting and participating. It also infers that there are degrees in the way that strabismics are affected and no two strabismics are the same. Susan Barry once said ‘You can control your vision and you are learning how to take control’. It’s true but it still sucked at the time. After all this time I’ve already gone from a situation of constant involuntary double vision to one where I can cause myself to have single or double vision at will. I’m well on my way of eliminating my eye muscle palsy. As I gain more control over my vision, I gain more control over my life. I gain more degrees of freedom.